11-14-2015 I went to Guttenberg Arts to work with Christina Pumo on some photo polymer plates. One image was an old one from grad school (done around 1974) that I never made into a print and the other was a photo I took of Titanus giganteus. Many thanks to Christina for her expert technical assistance. Also thanks to Bob Natalini whose magnificent beetle I photographed about 10 years ago. I made a transparency of this image in 1974! I was in grad school at the time. Later I put it away and never made a print from it. I came across it in my flat files around the same time I was planning on working with photo polymer plates. I worked a lot with insects making photographs, drawings and prints. This was a photo made in 2004 of Titanus giganteus, a large and beautiful beetle that was then in Bob Natalini's collection. Christina Pumo offered to help me with photo polymer plates. Here she's showing me how to make test plates. An old image brought back to life as a solar plate. 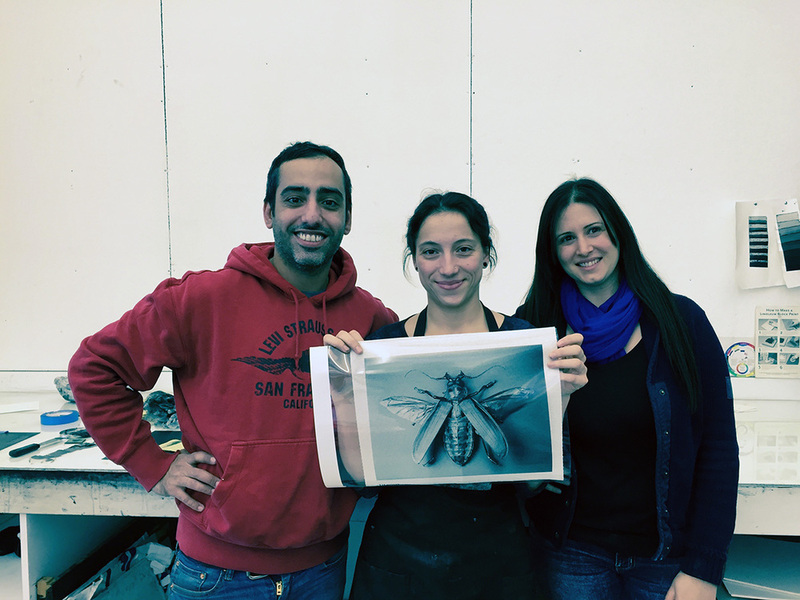 Matt Barteluce, Christina Pumo and Phoebe Deutsch with the transparency Christina had made for me from a digital file.